Serial entrepreneur Welson Ang has set up several businesses from scratch despite not knowing much about the industries but, sometimes, desperate times call for desperate measures. That was how his enterprise, printing firm Expressprint, came into being. Saddled with debt after leaving the Singapore Navy in 2004 and with a family to feed, Mr Ang, 36, struggled to find a job. "At that point in time, I had an 18-month-old boy and another baby boy arriving soon," he says. "I didn't have money to pay my utilities bills and the electricity was shut off. It was so bad that I had to decide between buying milk for my children and rice for myself. That was the darkest moment of my life." Mr Ang, who is now divorced, says he had to pull himself together and throw everything he had into setting up Expressprint, including about $1,000 which was borrowed. The idea came about as he went around meeting people and noticed that the first thing they did was to exchange namecards, which translated into a constant demand. "I had zero knowledge of design and printing. I needed to learn 10 times faster than anyone so that I could earn an income. "The hard work paid off and three months into the business, Expressprint was able to move into its first retail outlet in Chinatown Point." At its peak, Expressprint had 14 outlets but it now has only three as most of the business has moved online. It was not easy, says Mr Ang, who learnt the ropes as he went along and was swindled by suppliers and customers. Today, he prefers to teach people "how to fish", which is why Expressprint has an entrepreneur programme. "Within a two-year tenure, the company sets aside about $40,000 for an employee. If an employee wishes to branch out on his own, the company is willing to invest that amount in him. It motivates and encourages staff." Mr Ang has also set up other businesses, such as iGongZai, which offers custom-made figurines, and his latest venture, cafe chain Coffee:Nowhere. Nowhere should be read as now here, says Mr Ang, as "we came from nowhere, but we are now here". The father of three knew nothing about coffee, but he decided to take another leap after seeing the increasing demand for quality beverages. He was also encouraged by business partners with know-how. Coffee:Nowhere has outlets in Malaysia and Singapore, including one at West Coast Plaza which has been running a mini coffee fair, Coffee Explorer, which includes a latte art throwdown and ends today. Mr Ang wants to continue educating customers about coffee and has plans to teach people how to brew a cup of coffee from scratch for Mother's Day next month, from May 7 to 11. He is constantly looking out for new business ideas to invest in, and hopes to encourage those who have the same aspirations. Mr Ang, who has a girlfriend, says: "Being a boss is a lonely journey, but don't give up just because you think you don't know anything about a business or industry, or that you have yet to experience it." Spender in business, saver as an individual. A few thousand to tens of thousands of dollars for business. I'm attracted to card rewards such as Amex and Krisflyer miles. I invest in various businesses and have life policies. I build businesses, on a franchise or licence model, like Coffee:Nowhere. They provide me with steady income in the form of royalties, profits and fees. I specialised in financial trading for my banking and finance diploma, but had no flair for it, which is why I don't invest in stocks. I also invest in start-up companies. The risk is high, but the returns are high as well. Besides investing money, I assist in business planning and development. When I completed my Primary School Leaving Examination, my family was in a severe financial crisis. I started working part-time when I was 13, sweeping the floor for a local church. I was an odd-job labourer, metal welder, waiter and so on, until I signed up as a regular with the Singapore Navy at 18. For nine years, I enjoyed stability in my income and career. During my stint, I also earned a bachelor's degree in business, with a double major in marketing and e-commerce. As I didn't have a childhood, I indulged and spent unnecessarily and accumulated a mountain of debt, about $70,000, by the time I left the Navy in 2004. When I worked up to 20 hours a day, but my income multiplied only according to the number of hours I worked. I realised there was no chance of earning more unless I had more hours a day, and business was the way to go. The best way is to automate the process of a business as much as possible, so more can be done while you maximise the potential of profits. For example, with iGongZai, I made use of Web technology so that customers can buy products online without the need for human interaction. None. I'm not a property guy. A 2009 Sachs MadAss motorcycle that cost me about $10,000, including retrofitting and repairs. I rode it fewer than 10 times and eventually sold it at a great loss. People spend their youth travelling, but I spent mine working, so I hope to retire before 45 and tour the world when my body can still take it. I'll also be looking out for businesses I can invest in. A five-room Housing Board flat with my three kids - two boys and a girl. Q:What is your worst investment to date? The wrong allocation of time. I wish I had not wasted time on unnecessary things, and that I had gone into business when I was younger, instead of just reading and learning from textbooks. All my business investments have had positive returns. Besides printing services, the firm also developed the Printonline Portal where customers can place orders for common print products at prices up to 76 per cent lower than the market rate. The portal was initially based on a by-invitation model, and it became popular among young entrepreneurs, so we launched the PrintEXpert licensing programme under which licensees can use our platform and technology. There are now more than 500 PrintEXpert licensees. 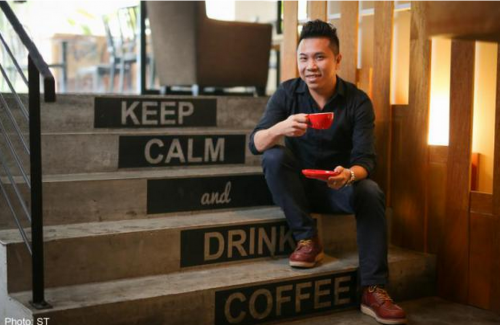 Coffee:Nowhere's first outlet opened in Malaysia in December 2013. Within eight months, we expanded to three other countries - Indonesia, Singapore and Vietnam. We have two outlets in Singapore. Last year, Coffee:Nowhere was the runner-up for the Promising Franchisor of the Year and Franchisee of the Year awards by the Franchising and Licensing Association of Singapore. Expressprint won the association's Star Achiever award the same year.